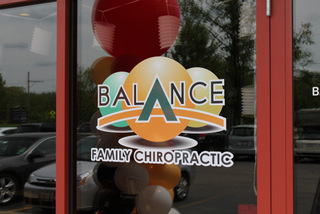 Balance Family Chiropractic Informs with Vinyl Window Graphics! 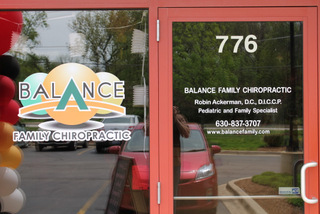 Located at 776 West Bartlett Road, Balance Family Chiropractic is the office of Dr. Robin Ackerman. This chiropractor sees not only adult patients but also children. In doing so, she is supporting an overall healthy lifestyle that includes chiropractic care as an answer for back problems and low back pain. Moreover, Dr. Ackerman has found that bringing children in to receive chiropractic care can actually assist with the treatment of bed-wetting and ear infections. 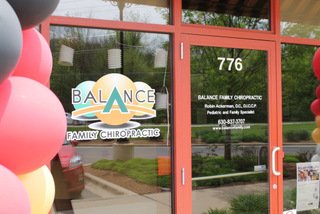 When it came time to add some vinyl window graphics to the office, the management team of Balance Family Chiropractic contacted Mark Your Space. We discussed the use of vinyl window graphics for Bartlett, IL, businesses. The goal for this office was the use of aesthetically pleasing window coverings that would add some definition to the interior of the locale, assist with branding and help to market to the consumers on the outside of the office. For the window panes of the entryway, we added the name of the clinic as well as the logo. On the door itself, we spelled out the names of the clinic and of the doctor, repeated the address for assistance with wayfinding, highlighted that Dr. Ackerman is also a pediatric chiropractor and offered the phone number as well as the website address for easy contact information. On the inside, frosted vinyl panels display the name of the chiropractic office as well as its logo. We also placed a vinyl banner across the window pane that highlights elements of a healthy lifestyle such as harmony and wellness. The definition that this look adds to the interior design of the office space is beautiful. The repetition of the company’s logo ensures that the graphics build name recognition and also support branding. Associating harmony and wellness with chiropractic care is a great way of helping consumers to appreciate the importance of this health care option. Are you ready to inform with window graphics for your Bartlett, IL, business? Here are the reasons why this is a smart decision for any type of company. Consumers take in information while they wait. Whether it is your business’ motto or mission statement, putting it up on your office’s glass panes is a great idea. Customers get more familiar with your company just by looking at the information that you display in this manner. Repetition helps with logo recognition. The more often a consumer sees your logo and company’s name, the more likely it is that this shopper will remember this information when out and about. In the consumers’ mind, your company should be synonymous with whatever niche you are in. If you can help the buyer to connect the blue widget automatically with the blue logo of your office windows, you might have won a customer for life. Have a dialog while gone. You do not have to be in the office to have a conversation with your customers. When you add window graphics to the door of your establishment, you can answer some of the most commonly asked questions. Customers want to know when you will be open, what your website address is, whether you are on social media and what your niche products or services are. When you post this for all to see, you might interest a passerby to come back when you are open for business. Stay tuned for more corporate graphics we completed for this chiropractic center!